Whenever people hear that I take a day of silence once a week, this information is met with curiosity, intrigue and resistance. A lot of my students have asked about my practice of taking a day of silence once a week, which is why I did a blog post on 3 reasons to take a day of silence and I created an Autumn transition day of silence for them in their membership community. (There is also a day of silence to evaluate your relationship to time – when you feel like you don’t have time, and a day of silence as part of the embracing self at home retreat). Instead of starting with a whole day, start with an hour. Start by taking an hour of silence, with no media, no talking, no cell phone, and choose to take an hour where you turn inwards and unplug. Feel the beneficial effects of being unplugged from technology and being in silence for an hour. The next time you can extend it to two hours. From there, try half a day and just keep gradually extending your day of silence as your comfort level allows. #2) Enlist the support of your family, friends and co-workers. Let those whom you normally interact with know that you are going to be in silence for the length of time that you are going to be in silence for. For some of you, this may mean putting something on your voicemail, creating an autoresponder in your email that says you will get back to them in 24 hours. Let your family members know of your intentions. My family members are incredibly supportive of my silence and support me by wearing headphones for media on my day of silence. My friends know that I take Thursdays in silence and won’t answer my phone or return their texts. I have one of our members moderate our membership forum on Thursdays and let our other members know that I will respond to urgent queries on Fridays. Tim keeps an eye on my email on Thursdays. Make sure you have what you need for your day of silence the day before. In order to support yourself in your day of silence, it is useful to make sure you have purchased your groceries or any other sundries you may need the day before. Not being in the shops is incredibly helpful to staying in silence on your day of silence. I have found just making sure I have what I need in my home the day before my day of silence helps to support me in staying in silence on the days I choose to turn inwards. 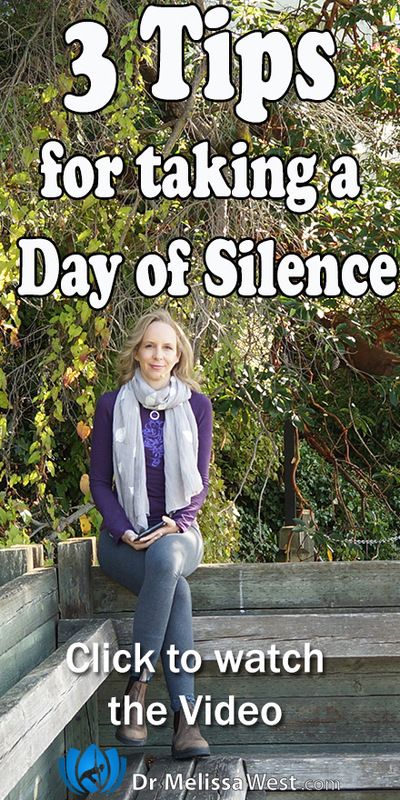 Do you have any questions about preparing for a day of silence? Do you take a day of silence and have any tips that you would like to share? Please leave them in the comments below.